Amber Lynn Perry once again sweeps readers into the tumult, danger, and unrest of the Revolutionary War with Patriots, Redcoats, spies, and romance. I admit, I’ve been curious about Captain James Higley since he first appeared. There’s more to this English Army Captain than meets the eye, so it’s fitting that readers finally get to know everything. When Caroline Whitney crosses his path, everything Captain Higley has been working toward is on the verge of discovery. People are watching him, and he is walking a fine line between loyalty and certain death. The pace does not let up, leaving readers on the edge as James and Caroline enter a den of enemies. Yet through it all, their courage and beliefs in God and freedom are on full display. 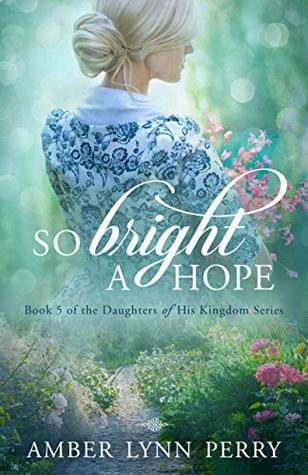 So Bright a Hope is an excellent finale to the Daughters of Kingdom series as it brings in some familiar faces while standing on its own for new readers who are just being introduced to Perry and her full-bodied stories.